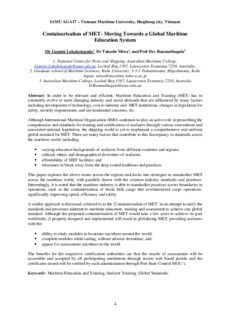 In order to be relevant and efficient, Maritime Education and Training (MET) has to constantly evolve to meet changing industry and social demands that are influenced by many factors including development of technology, cost to industry and MET institutions, changes in legislation for safety, security requirements, and environmental concerns, etc. reluctance to break away from the deep rooted traditions and practices. This paper explores the above issues across the regions and looks into strategies to standardise MET across the maritime world, with parallels drawn with the aviation industry standards and practices. Interestingly, it is noted that the maritime industry is able to standardise practices across boundaries in operations, such as the containerisation of break bulk cargo that revolutionised cargo operations, significantly improving speed, efficiency and safety. appear for assessments anywhere in the world. The benefits for the respective certification authorities are that the results of assessments will be accessible and accepted by all participating institutions through secure web based portals and the certificates issued will be verified by each administration through Port State Control MOU’s.